Home design trends don’t tend to be as fleeting as other trends. It’s a lot harder to change your kitchen cabinets than your shoes, after all. And few homeowners are comfortable committing to the expense and hassle of remodeling and redecorating to achieve the hottest new look if the the trend doesn’t have staying power; they don’t want interiors that will quickly appear dated. Nor do they want designs that are too personalized in ways that are difficult to change, because these can hurt resale value. It’s one thing to create a gallery wall of family photos; it’s another to install millennial pink countertops. With these points in mind, here are the home improvement design trends we’re seeing in Denver right now that seem to have staying power. Remember the 2000s, when everything was a sandy beige? Well, gray is the new beige. And just as beige remained popular for quite some time, grays are likely to as well because they’re so easy to maintain and coordinate with other colors. They don’t show dirt and dust the way white does or pet fur the way black does (though matte black is on trend right now for the more adventurous). Grays are great for kitchens, open living spaces and bathrooms, providing a soothing backdrop that you can punch up with pops of color—or not, if you prefer the minimalist look. We’re seeing palettes of monochromatic grays, gray with white, and gray, black, and white combinations everywhere we look. That being said, some designers think the gray trend is already on the verge of being over, and some homeowners might find grays more depressing than calming. 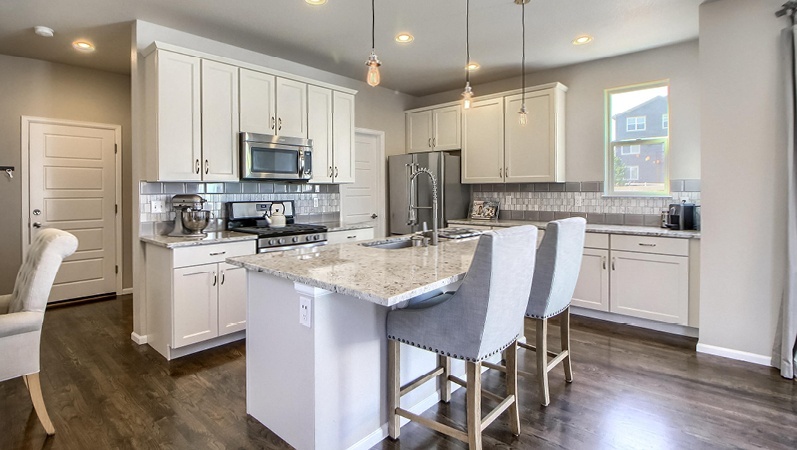 The open concept design trend that’s been in vogue for so many years is still popular with homeowners. And thank goodness for that, because building new walls is no small project. Great for entertaining, watching the kids while you cook, or keeping an eye on the game while you do the dishes, wide open rooms also make homes seem more spacious and create more flexibility in laying out your space. They also bring natural light into areas that wouldn’t have it if interior walls were in the way. Another design trend that hasn’t dwindled in popularity is the large kitchen island. If you like to cook, it’s an ideal prep space. If you like to entertain, it’s a great spot to lay out food and to stand around and chat. And if your kitchen is nothing more than a showpiece, it can be a convenient place to get some work done after hours. One newer feature that’s becoming popular in islands is lower counters that provide more comfort for those who do a lot of baking or cooking. Glass pendant lighting with vintage LED Edison light bulbs or other vintage features are popular, especially over kitchen islands. Not only are pendant lights practical -- providing light exactly where you need it -- they’re also a great way to add a trendy design element to your space that won’t be hard to swap out later on when design trends change. Important considerations include choosing bulbs that provide enough wattage for your space and hanging the pendants high enough that they don’t hit anyone’s head whether they’re standing or seated. Large windows let in natural light, brightening spirits and reducing electric bills. They’re great for taking advantage of Denver’s sunny weather and stunning views. When these windows are made from energy-efficient materials, they help your heating and cooling systems work more efficiently. Large windows and the views they offer can also provide a focal point for the room. Real estate agents would be remiss to advise their clients to integrate all the hottest new interior design trends for 2018 into their homes, like foregoing upper kitchen cabinets and buying a curved couch for the living room. Most people don’t need to be on the cutting edge of design and prefer more functional and classic looks that make for longer-lasting investments. But it’s nice to know what’s popular in interior design so you can make smart choices that will add value when updating your home’s look.